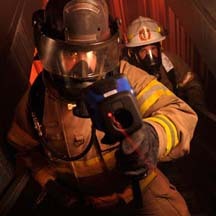 Thermal imaging cameras by Dräger are valuable tools for lifesaving orientation when fire, smoke, and darkness make navigation difficult. 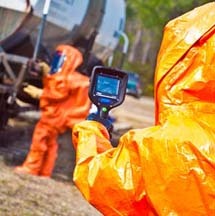 Search and rescue will be significantly easier and safer in the future with the Dräger UCF 6000. A resolution of 160 x 120 pixels and a field of view of 47° ensure that users are always informed about all details. The UCF 6000 is the basic thermal imaging camera to the UCF TIC II camera series. The UCF 6000 is a designed to meet and exceed the NFPA 1801 standard for thermal imaging cameras. The lightweight and ergonomics gives the camera a natural feel which will give the user a true one handed operation. The adaptive display brightness allows the user to clearly see the screen in all environments. The UCF 6000 uses the latest in thermal imaging technology that has super fast shuttering that has no freeze framing and an enhanced dynamic range that offers more sensitivity for a more detailed image. With the use of a integrated laser pointer will offer better localization to hot spots during overhaul and as an extended index finger. The snapshot feature gives the opportunity of sharing the thermal image with the rest of the team. 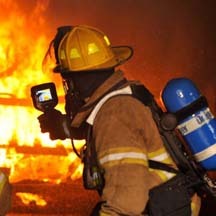 The UCF TIC II series cameras can be configured to go into automatic standby when the firefighter doesn't hold the camera for 5 seconds and go instantly on once the firefighter touches the handle.